Seattle, Washington (CNN) -- Less than two hours after picking out a man in a police lineup who held up his drugstore, pharmacist Mike Donohue was being robbed. The new robber's face was hidden under the hood of a bulky black sweatshirt. He rocked back and forth anxiously, with his right hand planted in his pocket. Like the other five robbers who had held up Donohue's store before, the man demanded OxyContin, a popular painkiller known for its high abuse potential. 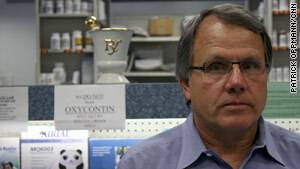 "My technician came back and showed me the note that said, 'Give me your OxyContin. I have a gun,' " Donohue said. 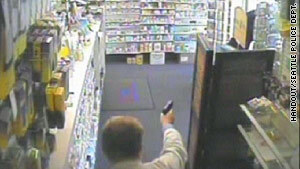 Surveillance video shows pharmacist Mike Donohue defending his drugstore with a pistol two years ago. Instead of handing over the drugs, Donohue unholstered the Glock 19 handgun he wore beneath his white lab coat and sprinted to the front of the small pharmacy. The pharmacist pointed the firearm loaded with 15 hollow-point rounds at the head of the hooded man. The would-be robber dashed out the door, with the pistol-packing pharmacist giving chase. Surveillance video cameras captured the entire incident. The man got away, only to be arrested that day. He later pleaded guilty to attempting to rob Donohue's store and to robbing another drugstore. Any sense of comeuppance Donohue feels about getting the drop on this robber is tempered by the knowledge that increasingly, pharmacists are under siege by violent attackers. "The number of these crimes has just skyrocketed," Donohue said from his pharmacy, which boasts bullet-resistant glass and a multicamera video monitoring system he installed after a 2007 robbery. "I have heard of colleagues who get pushed down on the floor with a gun to their heads. That takes a lot longer to get over. Some of them leave the profession." The assailants, often addicted to the powerful painkillers they are seeking, employ guns, knives and even bomb threats to rob the pharmacies. The state of Washington is one of several hot spots around the country for pharmacy crime. In the last three years in the state, there have been more than 200 reported robberies where controlled substances were taken, according to the Seattle division of the Drug Enforcement Administration. The organization does not compile national statistics on pharmacy robberies, a DEA spokesman said. But RXPatrol, a collaboration of pharmaceutical giant Purdue Pharma and law enforcement agencies, listed nearly 2,000 robberies nationwide in the seven years the group has kept track of the holdups. Pharmacies voluntarily report the robberies to RXPatrol, so the true number of crimes is probably much higher, said Capt. Rich Conklin of the Stamford, New Jersey, Police Department, who advises drugstores on how to deal with the robberies. Nationwide, the majority of drugstore robbers are white males who are in their 20s and hooked on painkillers, Conklin said. "A lot of them have become spree criminals," he said. "They are very determined and probably not in their right frame of mind." Unlike banks, though, most pharmacies do not have the high-tech security or armed guards to prevent robberies. "They want to be known as the neighborhood pharmacy where you know your pharmacist," Conklin said. "They don't want to have to buzz customers in or talk to them through bulletproof glass." Pharmacist technician Geraldine Crews was roughed up by an armed robber seeking drugs. For criminals addicted to powerful narcotics, Conklin said, even small-town drugstores can offer a supply of high-grade painkillers. "There is the myth that pharmaceutical drugs are safer," Conklin said. "But these are drugs you are supposed to be taking under a doctor's supervision." For many robbers, holding up pharmacies has also become a lucrative business. OxyContin, the popular painkiller, can be stolen and resold for a dollar a milligram, said Detective Mike Magan of the Seattle Police Department. A bottle of 60 80-milligram pills could bring in close to $5,000. Factoring in the money made reselling the drugs, Magan said, pharmacy thieves in Seattle are stealing as much as bank robbers. "Some of the bank robbers have now actually stopped robbing banks and cut out the middle men and gone directly to the source," he said. "And that's robbing the pharmacy." Magan said hunting down the robbers is complicated by the fact that many pharmacies do not have sophisticated cameras placed where they can photograph the robbers' faces. "They are easy targets," he said. 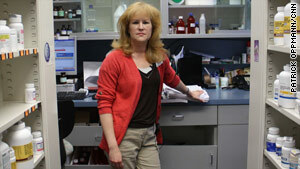 "There needs to be some of kind of standardization: ... better counters, the drugs more secured. Some of the pharmacies have taken substantial steps in doing that, and it's deterred robberies." Bill McNary has taken a further step in deterring robberies: He no longer stocks OxyContin and posts signs on both entrances to his store to let thieves know they will not find the drug at his pharmacy. Pharmacist Bill McNary stands in front of a sign telling would-be robbers that he has no OxyContin in stock. Still, there are no guarantees that robbers will take note. "These aren't the kind of people who necessarily read signs," he said. Geraldine Crews, a technician who works for McNary, remembers the evening a year and a half ago when a hooded, tattoo-covered robber leaped over the counter with a silver pistol in his hand. "I was resigned to the fact that he was going to shoot us," Crews said in a steady voice. At gunpoint, the robber forced her to empty a drawer of painkillers into a bag. She estimated the entire takedown lasted only about a minute before the robber fled. "It gets your adrenaline pumping," Crews said. "The first thing on your mind is intent: Are they going to kill you? In his heyday, James Fogle figures he stole drugs from hundreds of pharmacies. He did not keep an exact tally over the decades as each pharmacy helped feed an ever more demanding prescription drug habit. Usually, there was no violence involved as Fogle and his crew drilled holes into the roofs of drugstores late at night or, when a pharmacist's back was turned, they grabbed what pills they could and ran. "They put in a lot of alarms, but eventually, people figure out a way to beat them alarms," said Fogle, 74. "If it's worth doing, it's worth doing right. I did it all my life." During his numerous stints behind bars, Fogle read through entire prison libraries. Then he tried his hand at writing books, including the cult classic "Drugstore Cowboy," a novel about pharmacy thieves that was adapted into a 1989 movie directed by Gus Van Sant and starring Matt Dillon. But his brush with Hollywood clashes with his current surroundings -- a Washington state prison. Sentenced to 15 years in March for attempting to rob a pharmacy with a BB gun, Fogle is fighting debilitating lung ailments and is confined to a wheelchair. He doubts he will live to serve out his sentence. "Drugstore Cowboy" author James Fogle is serving a 15-year sentence for attempting to rob a drugstore with a BB gun. Much of Fogle's long career spent stealing drugs is a blur. But his first pharmacy heist in Van Nuys, California, still can trigger a smile and memories of a huge score. "It was a dandy, man," Fogle said. "It ain't too good when your first one is a jackpot. You are lost forever." On the front window of his pharmacy, Mike Donohue lists the names of the men who have robbed him of drugs. They were all eventually caught, he said, because of a simple truth: They couldn't stop. But that's little solace for the pharmacist who fears he is pitted against a new, more dangerous strain of criminal. "There's people who are messed up on drugs and get desperate, and then there's people who get mean." Donohue said. "There's a big step between someone who's hurting themselves and someone who's willing to take the life of someone else." Donohue said he is disappointed by Washington state lawmakers' inability to impose tougher penalties for pharmacy robberies. When he started his career two decades ago, Donohue said, he never imagined having to wear a gun or put bullet-resistant glass on his store windows to keep any shots he fires at robbers from breaking through and hitting someone walking by. The pharmacist's methods may be unorthodox but he says they are working: Since Donohue pulled a gun, the robbers have not come back.